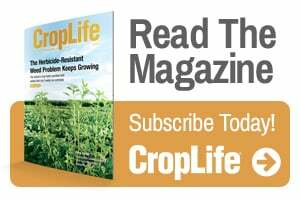 In this era of glyphosate resistance, the new herbicide systems hitting the market will definitely help, say dealers, but if not scrubbed from sprayers, they can pose a hazard for crops without tolerance genetics. Then too, veteran products used in different pre and postemergence programs can be tricky to get completely out of rigs and away from non-target fields. Dicamba, for instance, is certainly not new, but “you’re just potentially going to have a LOT more acres in play,” he points out. South Dakota Wheat Growers, Aberdeen, SD, already applies a good deal of dicamba products in clients’ corn acres, so switching rigs from corn to soybean acres is not a brand new system, says Brad Ruden, director of agronomy tech service. “But we have a renewed emphasis on doing the proper tank clean-out so we can eliminate one source of off-target movement of this particular product,” he says. Bob Wolf of Wolf Consulting & Research, Mahomet, IL, emphasizes the need for a sprayer-wide approach to clean-out. “There are numerous locations throughout the system (from entry to the exit at the nozzle) that have potential for contamination. It’s no longer a problem limited to the sprayer tank,” he says. To start, Ceres’ Nagel says applicators need to know their sprayer, identifying spots where product can sit or hang up in the system, be it in a John Deere, a Case or an AGCO rig. Wolf believes the designs of newer sprayers are better today, with engineers including rinsing nozzles and better sumps, as well as improvements in other sections of the equipment. Dave Mulder, product marketing manager, application equipment, with John Deere can attest to that. The company has improved sprayer plumbing and plumbing layout, as well as reduced the number of valves in rigs. In fact, Deere’s new 4 Series sprayer has a feature which allows the operator to “purge” the boom of all the product before rinsing by sending a high psi and volume of air into the boom plumbing to push out the current product mixture prior to clean-out and changeover. “We’ve also changed our plumbing to include what we call the end cap aspirator, located just beyond the nozzle tip at the end of a section. It really reduces the number of ‘dead spots’ in the boom where product can potentially settle out,” he says. Mulder adds that the end cap makes it easier and simpler for applicators to do a clean-out and changeover between product types. It also makes it easier for them to inspect inside a boom to make sure there’s no residue left over. 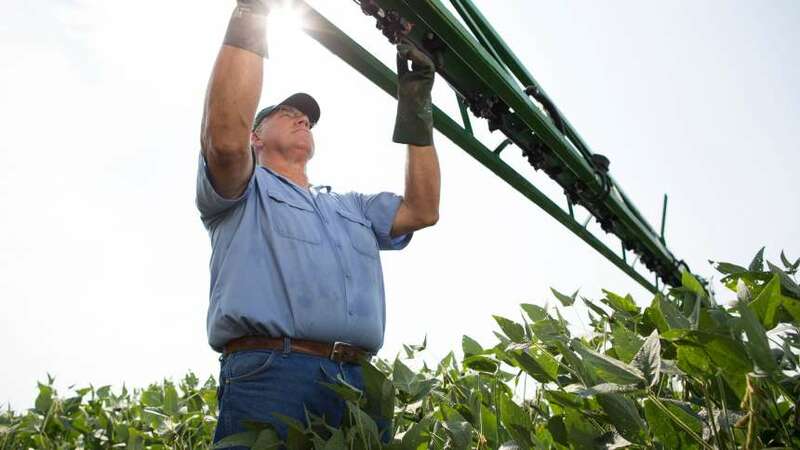 For older machines, Deere has been recommending the Express Boom solution from Hypro. Here, applicators can simply change out the plumbing on the ends of a boom. Different kits are available for different manufacturers’ systems, from pull-type sprayers to commercial rigs. Direct injection technology on sprayers is becoming more popular to help reduce the extensive cleanouts needed with conventional tank mixing practices. Nagel describes one scenario where an applicator might mix Roundup and adjuvants in the main tank, then have a separate tank for a dicamba product, to be injected upon delivery only where needed. “That way if you have a set-back or border that you can’t use the dicamba on, you can switch it off, and you don’t have to clean the nurse truck and sprayer out.” Or make a separate trip over a field to clean up those edges. Nagel says that Ceres is purchasing new commercial sprayers with direct injection systems already built in, and older units are being retrofitted with them. (At $15,000 to $25,000 per system based on tank size, upgrades don’t come cheap.) In fact, some of the new rigs feature two or even three injection systems for two or three products. The approach is especially helpful for retailers who normally mix at the branch — where vats, inductors, pumps, hoses and lines are involved. Then there are nurse tanks as well as sprayers to clean out. “Injectors are a way to minimize what could go wrong at the branch and the nurse truck and isolate any problems to just the spray boom on the sprayer,” Nagel explains. Some stakeholders have been debating about whether straight water can cut it as an effective clean-out solution. Unlike glyphosate, which is very water soluble and can be easily cleaned out of a sprayer with water, the dicamba products (plant growth regulators such as Clarity, Banvel and 2,4-D) take a lot more time and care to remove, says Paul Haefner, business development specialist with AGCO Corp. They readily adhere to the inside of a sprayer, particularly to plastic and rubber parts. “They cannot be completely and readily rinsed out of a sprayer with water only,” he says. Clean-out instructions will be a key part of the eagerly anticipated EPA labels — with a projected release in November — for the new systems. “Some manufacturers and Monsanto feel like water is good enough for their dicamba, and it’s been discussed in different meetings. I’m worried that the label may say that. EPA may believe it, but water is not effective, and we’re now trying to show companies that a commercial, approved, tested product can be very important to make sure we can clean things out,” says Jeff Bunting, crop protection division manager at GROWMARK. Wheat Grower’s Ruden is encouraged to see how his co-op’s chemical company and adjuvant partners are working together. “Our adjuvant suppliers are making sure they have appropriate clean-out products to aid in that triple rinsing process,” he says. Bunting notes that based on tank cleaner sales alone, his company has seen more focus on sprayer clean-out over the past two seasons than its seen “in quite a while,” due in part to the growing popularity of the LibertyLink system. For its part, John Deere has its own labeled cleaning product called Incide-Out, but the company is also recommending one called Erase, from Precision Labs. It contains neutralizers as well as detergents that help break up and loosen up caked-on, emulsified product in the booms. Mulder’s best advice: Follow both chemical manufacturers’ labels and equipment operating manuals’ instructions care­fully. There are multiple different sizes of tanks and types of booms and boom plumping out there. Each of those systems require their own unique set of clean-out instructions. “As a manufacturer we do our best to prescribe that best methodology. During our sprayer development, we test other equipment and chemical manufacturers’ instructions. We work with chemical companies, too, to ensure that we do the best we can in the design to make the best clean-out happen,” says Mulder. Wolf points to another specific area applicators should focus on. He is concerned that filters and screens may be overlooked. The filtering systems have a great potential to hold onto product, releasing it later. 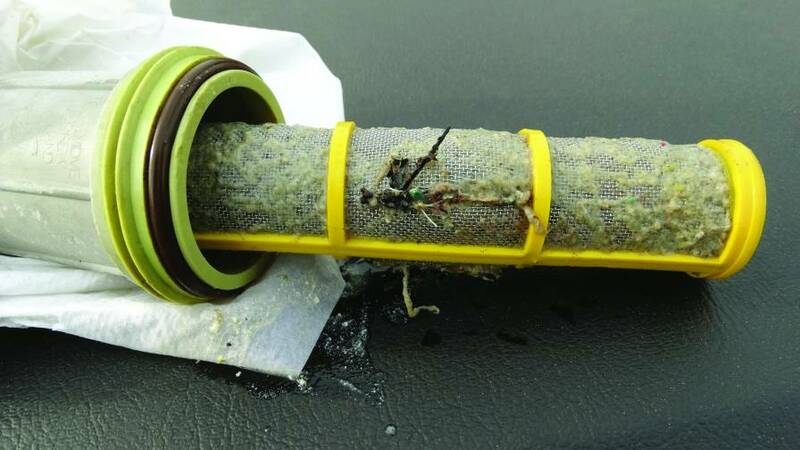 During a busy season, a filter can get easily clogged. Wolf also raises the question of what an applicator should do with rinsate. “A proper clean-out likely involves a lot of water — I don’t know how much yet, that will be learned — and my fear is the operator will dump it on the ground at the application site or elsewhere,” he says. He cites groundwater contamination as one possible problem here. Applying the product over the sprayed crop will work, as long as it’s within the labeled rate — but that involves another trip across part of the field. But will growers want that additional traffic? “To me, that is the best way to do it properly,” Wolf says. Another option is using a rinse pad to capture and reuse in another tank mix. But, most applicators will not be at the plant to do a rinse over the pad, and many tell him they travel a long way to get to a field — 30 to 50 miles is not uncommon. How do drivers tell if a sprayer is truly cleaned out? Wolf raises the possibility of some type of “litmus paper test” that can be done after the rinse process, to test for the presence of unwanted product. Perhaps such a product could become a priority on chemical companies’ to-do lists.